but he will drink no more. The rhyme helps you remember the formula, but the poem makes a point. There’s a big difference between water ( H2O) and sulfuric acid ( H2SO4). 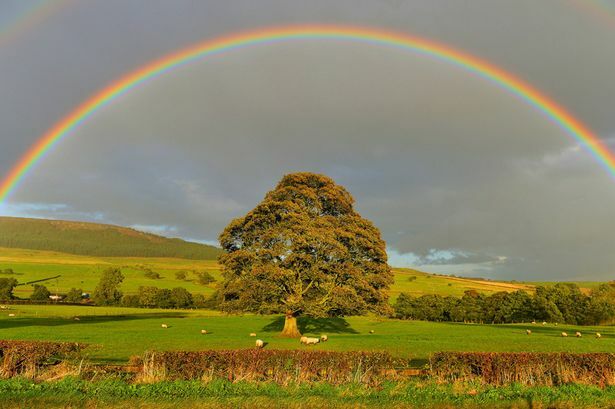 Who would have guessed that rainbows appear not only in an atmosphere filled with water (H2O) vapor but, also, in an atmosphere filled with sulfuric acid (H2SO4) vapor? Yes, the vapor of this highly caustic acid works as well, or better, than water vapor for producing rainbows. But it doesn’t work half so well for producing a pleasant atmosphere. On earth, we’re happy enough with our water vapor. And the planet Venus gets by with its sulfuric acid vapor. But this left a mystery. Researchers have known for some time that sulfuric acid vapor is great for producing rainbows. And they’ve also known that the atmosphere of Venus is full of sulfuric acid. So, when we looked at Venus, we should have seen some rainbows. But we didn’t. So, why would the atmosphere of the planet Venus, an atmosphere filled with sulfuric acid vapor, never produce a rainbow? Most suspected that there was something else in the air. Something that absorbed the light before it could be reflected out of the vapor as a rainbow. No one could figure out what this (ultraviolet) “uv absorber” was. No one has every stood on the surface of Venus. No probe has successfully landed on the planet’s surface and, then, aimed its camera up into the sky. So, there’s really no chance of seeing “a rainbow” on Venus. But, whether through the lens of an earth telescope or a camera on a probe orbiting the second planet, the view from above should have revealed at least one glory. In 2011, as reported in the Journal, Icarus, Wojciech Markiewicz, of the Max Planck Institute for Solar System Research in Gottingen, Germany, and his colleagues maneuvered the European Space Agency’s Venus Express spacecraft in an effort to find a glory. And maneuvering was needed. It turns out that, to see a glory, you not only have to be watching from above, but the sun must be directly behind you. So, if you’re not looking down with the sun at your back, there’s no chance you’ll see a glory. 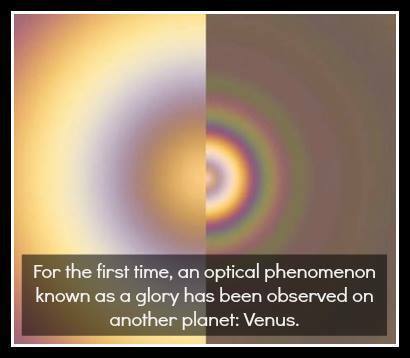 On July 24, 2011, after more than a little maneuvering, the group found and photographed the first rainbow (glory) ever seen on Venus. Still, no one is sure why glories are so hard to find. With the sulfuric acid in the atmosphere, they should be a relatively common thing. Again, it may be that other elements in the atmosphere affect the reflectivity and refraction of the vapor. Venus, our nearest neighbor in the solar system, seems to get little attention in comparison to the red planet Mars. 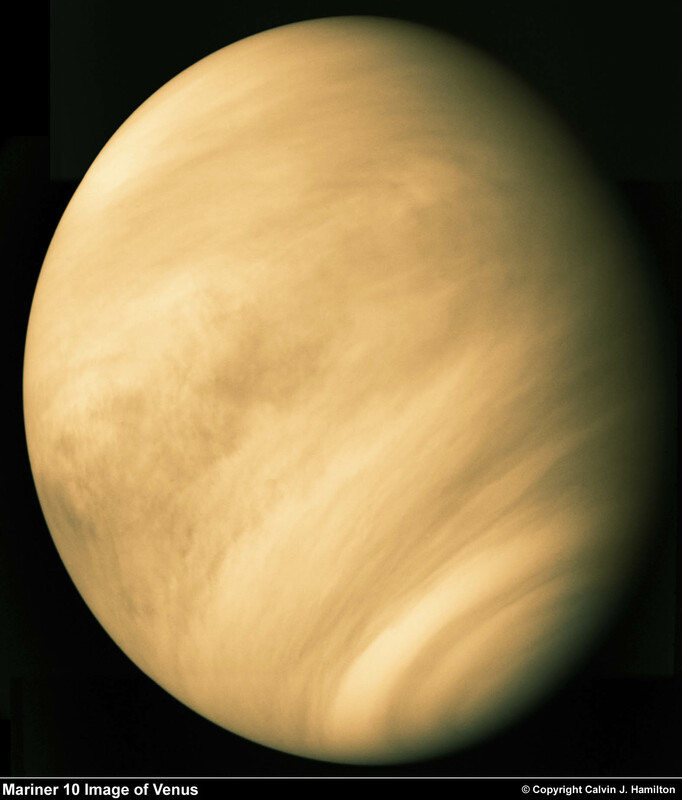 Maybe, this is because Venus’ solid surface is a less than friendly place to visit with a fairly constant temperature between 400 and 500 degrees. Venus is about the size of the earth and actually passes closer to the earth than Mars. While Venus orbits around the sun in the same direction as the earth and all the other planets, it’s rotation on its axis is reversed. So, to someone standing on the planet’s surface, the sun appears to rise in the west and set in the east. Viewed from the earth, Venus appears to have a bluish cast. But the second planet from the sun is actually white, or at least, white is the color of this planet’s constant, thick cloud-cover. Like all the planets, Venus reflects the light of the sun. So, with a telescope, or just binoculars, Venus is seen in a crescent phase. This bright point of light in sky is easy to mistake for an aircraft. Venus enjoyed something of a notorious reputation during the 50’s and 60’s as an official or “stock” explanation for reports of UFO sightings. This apparently bluish star is so large that, even with the naked eye, you can almost make out the spherical shape of the planet. Night or day, Venus is the third brightest thing in the sky – only the sun and moon are brighter. Never too far from the sun, Venus appears sometimes above the eastern horizon before the sunrise and sometimes above the western horizon shortly after sunset. This entry was posted in Grossmann: Over the Rainbow . . . on Venus? and tagged Grossmann: Over the Rainbow . . . on Venus?. Bookmark the permalink.